Just when you think Tesco has revealed a new Call of Duty title, they also had a listing for a new Halo title to come out this year. 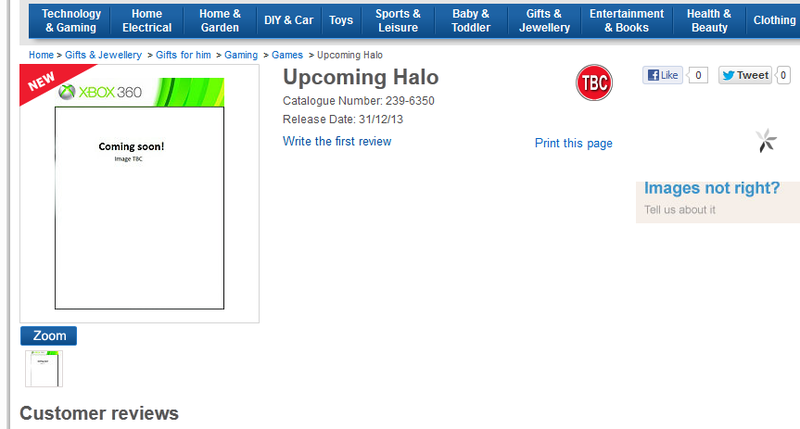 HaloGAF showed off a pic of a listing on the Tesco site earlier. I'm going to guess this is going to be Halo 2 Anniversary. Halo 5 is most likely not ready yet and Halo 2 Anniversary could be a launch title for the next Xbox this holiday season. Thoughts? EDIT: This might be not real, or Tesco is having a bad day. Frankie, who posts as Stinkles on HaloGAF, made a short "Lol. No." comment on the post where this image came from. We can sure hope for a Halo 2 Anniversary, WITH multiplayer support. And none of this split second lag when trying to play co op online. That in itself would give me more hope for 343. I would love halo 2 anniversary. Even if it was just like CEA, graphics, terminals maybe and some maps for the current halo game. Oh, and online co-op. Not my fault... someone put a wall in my way. As I did not play halo 2 the first time round it would be awesome for 343 to remake the campaign etc, especially as original xbox games do not work on my 360 because of my new harddrive. I for one would welcome H2A with updated graphics and cheevos, H2 has some of the best campaign missions and my copy is scratched and only lets me play the first 3 missions. May have to pick up a new(old) copy anyway. Never was a fan of Halo 2. It's the only campaign I never finished. I just got board with it about half way through. Scarab gun was one of the best video game memories as a young Seth. Unfortunately some of my lesser favorite moments was getting trolled for several hours thinking there was a golden warthog in the very same game. If there's a scarab gun, why not a golden warthog?!? I spent countless hours in the Halo 2 campaign just trying to do a bunch of different things like hunting for easter eggs and anything else I could think of. I only wish I actually had the chance to try out the online multiplayer before they discontinued Xbox Live support for the original Xbox games. I am not sure that would work as I don't think not having the update is the problem, I think it's something to do with my new xbox hard drive not being an official one.